Vrooom! Vroom! new car car from Solivite. Mamarazzi was lazy again. Not cooking dinner as she was still a bit full. Hence we went to the nearby Taman to search for something light to eat. 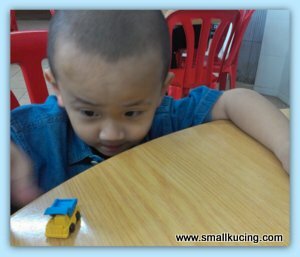 My little yellow car. 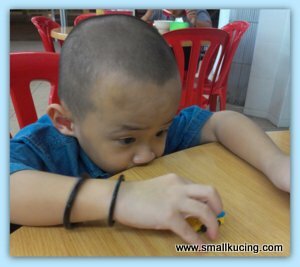 We pusing punya pusing still no idea what to have. Then saw this new branch of Ipoh Road Yong Tau Foo. Decided to have some. 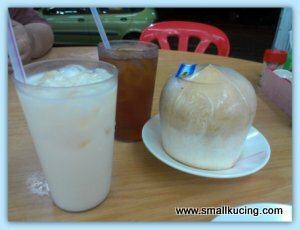 The coconut is for me as I have been having a lot of heaty food like durian lately. Fried Dumpling and Fu Chuk Rolls for Papa. 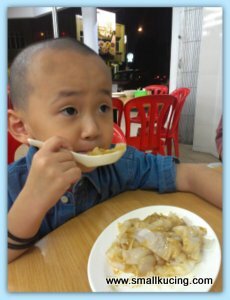 And Chee Cheong Fun for Papa and me. Not really enjoying my CCF coz I have no appetite too. 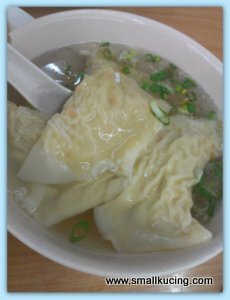 Mamarazzi's bow of Dumpling with soup. Adequate though for her it's not as good as those that she made at home. 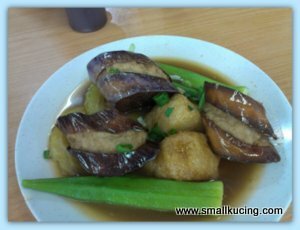 Was rather surprise when the bill came as we noted each piece of Yong Tau Foo now cost RM1.10. Price of food really increased everywhere. Guess we won't be having YTF that often now. SO eating there was expensive? RM1 per piece? Really expensive..
Ok lah...I prefer soupy yong tofu. Hang!!! Happens ALL the time if page halfway refreshing & I try to scroll. Tsk! Tsk! Don't know if my comment got through or not! Tsk! Tsk! So-so only lah! I prefer soupy young tofu. Ya loh. Everything is increasing. Canned food really increase a lot. Somehow Ampang pops up when yongtaufu comes to mind haha. Thanks for your well wishes shall go for another check up in Sept to confirm on my eye operation. 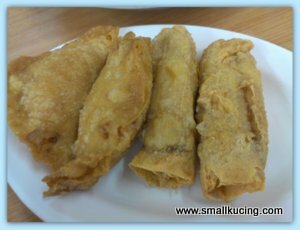 yalor, nowadays the YTF very expensive to makan lah.. the cheapest also RM1 a piece, all same price no matter big or small..
those famous one somemore RM1.10, actually eat once in a while OK lor.. somemore YTF not very filling, eat then at least 10 pieces a person right?? somemore hor i think this Jalan Ipoh YTF opened too many outlet already, a lot also no standard one.. some outlet nice and most of the outlets not nice at all..
i still prefer their old shop at Jalan Ipoh, at least that taste is more guaranteed lah..
last time i studied in Jalan Ipoh mah, haha, go to the YTF quite often after school.. that time RM0.50 a piece only.. I just realized I always ate YTF and never checked prices. Just eat, pay and go! Now you got me to be more conscious on the prices! Like Thambee said, the old shop at Jalan Ipoh was nicer. I think they upgraded to the old bungalow house. Normally I will order 6 pieces of fried dumpling for myself and dip into so much chilly sauce. Damn yummylicious! LOL...so much can finish ka??? 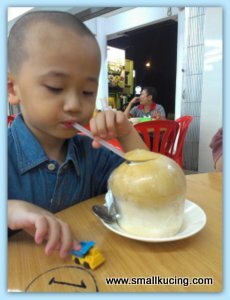 One of my best drink is coco nut drink..Ya It looks like he got no appetite..